It's been great working at New Grounds. Learned a lot, met so many interesting people and it's a very good working environment. I'm sorry to leave but looking forward to the next step - Rhode Island. I'm getting the 11.30pm plane and should arrive in Boston early tomorrow morning. I've been at the workshop since 9am printing up plates. They are looking good. It's now 7pm and I'm tiring a little but it's late night opening at the Print Workshop so I'll do a quick blog and then print for another half hour. It was really busy here today - loads of people in printing but it's a big place with quite a few rooms so there's plenty of space. I met some new people and all the other I've met before. The standard of work here is very high and it's exciting to see other people produce such good prints. Meanwhile, where should I eat? I'm considering trying Cafe Cubano - it's a cafe and a hair salon. I hear it serves good food and it also offers a late night trim for $25.99. I spoke a little Spanish the other day, so maybe I'll manage a little more here. My hair must be all of 2 inches long so maybe I should get a trim too. A few photos to illustrate the places I've been to. Most of them are still on memory cards. It's a wonderful morning. As I walked up the road to the Flying Star, a few yards up Central Avenue, old Route 6, (www.flyingstarcafe.com/locations.htm) for breakfast, I looked up at the Sandia Peak mountains. No clouds at all - beautiful blue sky. Yesterday was overcast and there was even some rain. I couldn't put my test plates out in the sun to harden. However, there wasn't a thunderstorm, which was good. The Weather Channel warned of this possibility and said you should avoid taking a bath or washing up the dishes. Mmm...it didn't say I shoudn't have a shower and go printmaking, so I carried on as usual. Sunday was good. Great day of printing and beautiful weather. I wandered down the road to the Organic Coop to pick up some lunch to find what looked like a full scale street party in full swing. It was Earth Day - and there were various environmental stalls explaining about renewables, sustainability, recycling etc. They were baking cookies in little solar ovens on the pavement. Someone was pedalling a bike to power a water pump and loads of other things. In a marquee, there was a rock band playing a people were dancing so I joined in (I mis the gym) for a while and then, bought and ate some good while watching some dancers. All that before returning to the print workshop to continue with Photogravure. It's a lovely light, clean and very large workshop and Regina, who owns and directs it is a highly skilled and knowledgeable printmakers. She also runs 2 adjoining galleries, one print and one that has paintings, 3D pieces, mixed media. She takes the concept of multi-tasking to new heights. All this with extraordinatry good humour. I've met many good printmakers including Leonora, Jorge, Jacqui and Ray who was teaching a small class on collagraphs. It was definitely a good decision to come here. I came out of the motel on Route 66 this morning, looked up at the blue sky and it was dotted with bright coloured hot air balloons. It's going to be a good day for printmaking. Had breakfast at the Flying Star - it was busy, even at 8am on a Sunday. I ate oatmeal (porridge) but most people were eating a great deal more than me. I certainly couldn't contemplate a breakfast burrito with plenty of green chile. I shot a plate today! I shot a plate today. Wow! (That's positive by the way, and there are no holes in it. More of that later. It's not been convenient to get to a computer in the last few days, so, in brief... I visited Meteor Crater, just off Route 66. It's the best preserved crater caused by a metor hitting the earth. NASA train here once a year, apparently, and various films have been shot here. Amazing place but very, very windy. Tours around the rim and into the crater were cancelled as winds were at 87 mph. So, I got a good view but kept back fro mthe edge. The Painted Desert was wonderful - beautiful coloured sand and rock. The Petrified Forest had huge, ancient trees just lying about in the desert, the wood chrystalised. Santa Fe, the tiny capital, is off a previous alignment of Route 66 and most of the houses are rectangular, flat topped buildings made of "bricks" of clay. I'm now in Albuqueque at the New Grounds Print Workshop and have started making my first Photogravure plate. I'm using an image of some old car part directories which I photographed in a shed behind a general stores on Route 66 - a high desert stop on the way. Amazing trip along a very old part of Route 66 on an undulating, switchback of a roadwith hairpin bends and steep drops over a mountain pass and through the desert. Stopped for a break at Cool Springs - drank some lemonade and admired the old petrol pumps, I chatted to the woman who runs this beautiful oasis and she explained that there had been just a tiny drop of rain recently and it had opened the cactus flowers up. I've already forgotten the name of the red flowers waving on tall spikes. Apparently some of the early 50s cars went in reverse up some of the steep parts of the road as it's a lower gear than first. Is that a good idea, I ask myself? It's rather like driving with your eyes closed - which I am tempted to do when things look scary, but it's probably not a great strategy. Thinking of the various people who've travelled on Route 66, or dirt track versions of it,it's just possible to imagine back to the 30s when characters such as those from Steinbeck's Grapes of Wrath were crossing the land, when I'm travelling across the desert and open plains areas. Vast areas of nothing. If they were looking for more fertile land you can see why they kept going to California - to the untrained eye the desert doesn't look easy to cultivate. I can see why Americans use words like, "awesome" to describe this wide landscape. It's easier to imagine the era of the late 4os and 50s travelling much more for pleasure, to try out their new cars etc on Route 66 (Bobby Troup's Get your Kicks on Route 66 song. Some of the landmarks from that era still remain. The snake pits and roadside zoos have (mainly) disappeared but the trading posts (souvenir shops? ), cafes, motels etc are still largely here. Some now faded but often still vintage outrageous. I was searching for the screen and sign, and other remains of a drive-in cinema, back in Winslow and just managed to see the sign. There were bulldozers in the field and another sign was attached to the old drive-in sign advertising land for sale. The sign will soon be gone too. Flagstaff was a different place altogether - had a tour round the Lowell Observatory where Pluto was first discovered. Apparently Percival Lowell got some bike repair shop workers to construct an observatory (strange in itself). Then he used a "telescope" that was really a camera with huge zoom as you couldn't look through it to see planets etc but just take photos. He paid someone to sit in the observatory for 2 years taking photos of a bit of the sky he selected. Then he compared the photos until he found the planet that moved - which was Pluto! Would like to see the sky at night through a telescope there. It's so clear and you can see so much. I'll return to Flagstaff later. Went on from there to Twin Arrows. There's nothing much there except, yes, two arrows but they are very big, enormous in fact. They are planted in the ground outside what is now a deserted petrol station, cafe and broken down trading post. Onward, through Meteor City (there's a huge meteor crater nearby) and on to Flagstaff. It's 7,000' high (twice as high as Mount Snowdon in Wales) and you can look up at 12,000' mountain range nearby. There's snow on the top and it's skiing country. Freight trains blast their horn as they roar through the railroad station, night and day - no-one sleeps here... Not many passenger trains though, just two a day. Went down to Sedona at 5,000' which is surrounded by red rock which looked great at the end of the day with bright sun and long shadows. Anyone who knows me will know how much I love rock, and I don't mean Brighton rock - though, as a Brightonian I have to say that's obviously great! The Canyon de Chelly doesn't disappoint. Wonderful, eroded shapes and colours. The south rim starts at an elevation of 5,000' and rises to 7,000' I could feel the effects of the altitude yesterday when I raced up a path to escape some momentary rain and caught my breath. I can see why Paula Radcliff trained at altitude in the S West (Abq) If you can run here, you can run anywhere. Looking down into the canyon floor you can see miniature sheep and cows and strips of land with corn growing. A cow's moo and the bells of the sheep sound amplified, like there must be giant animals down there. Anyway...off to the gym to train...then back to Route 66 and off to Winslow. I'm just into the state of Arizona having driven through snow to the Canyon de Chelly, a side trip off Route 66. It's sunny now and I'm considering going down into the canyon to see the amazing stripey red and orange rock formations close up. I love the wide desert plains on the way here. Pale yellow and bright pink, orange and red sand and rock and areas of pale green sage brush. So far, have come through New Mexico travelling from Tucumcari, Santa Rosa, Grants, Gallop and then over the state border. Heading next to Winslow and then Flagstaff - both great places on Route 66. Following Route 66 is fascinating. Sometimes this 2-lane road is swallowed up by the 4-lang interstate highway and disappears for a while. Often it runs next to it and shows signs of little use - grass breaking through the tarmac, tumble weed blowing across the road. Sometimes it leads off into a "business loop" to small roadside communities. It often follows the line of telegraph poles and/or the railroad tracks. The buldings along the roadside are often diners, petrol stations, shops. Some have disappeared totally. In some cases the signage remains, such as a restaurant in Santa Rosa, or the Longhorn Ranch sign , standing high and rusting on its tall poles. Other buildings have bene well preserved such as the Blue Swallow Motel in Tucumcari. On the other hand the Jones' Motor Co. Texaco garage and car repair workshop has completely changed its function to survive. It's now Kelly's Brew Publ. It's been turned into a restaurant and micro brewery with patio heaters next to the vintage pumps on the forecourt. You can have a coffee or sip a beer out there, watching the Route 66 traffic and the sunset deep pink on the Sandia Peak mountains. Well it was just about 24 hours travelling door to door, Manchester airport - Newark - Albuquerque, NM. Quite a journey. Slept a while, readjusted my watch to USA Mountain time and headed east in a Chevrolet to Tucumcari along I40 and Route 66, listening to Big I radio. Heading east the temperature plumeted and signes of yesterday's snowfall could be seen. It was 85 degrees F here a couple of weeks ago, now it's barely above freezing. Had a warm welcome from the owner of the Blue Swallow Motel (vintage place) but will the "tourist cabin" cope with the cold? The heater looks promising. Huge hailstones hit this small town a couple of weeks ago shattering the neon lighting everywhere costing a $20,000 to fix - neon is important on Route 66 but I won't be seeing as much of it here as I'd hoped. This is an interesting place, full of 50s and 60s places liked Tepee Curios, old petrol stations... however I'm heading west to warmer parts tomorrow. 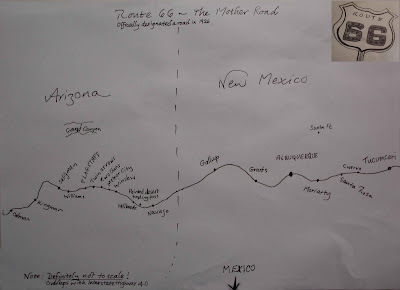 I've been mapping out my journey on Route 66. The whole road stretches across the country from Chicago to Santa Monica, Los Angeles, but I'm just travelling the part in New Mexico and Arizona. US 66 no longer officially exists but most of it remains. People usually travel on motorways (interstate roads) and the old route 66 is just nearby. Anyway, I'm going to find it and see what's there.